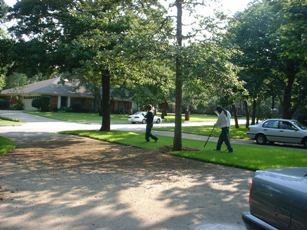 By far the best route is to hire an arborist that uses the air spade to expose root flares. The Air Spade is a fancy sandblasting type tool that blows air (no sand) at a high velocity and removes the soil without damaging even the smallest roots. 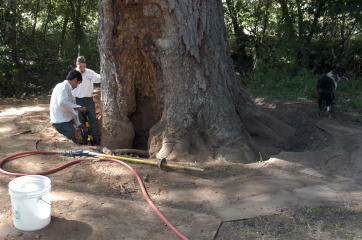 Here's the State champion pecan tree in Weatherford having its root flare exposed with an air-spade several years ago. Moore Tree Care in Dallas donated the work. The patient is doing well but we still have our fingers crossed. 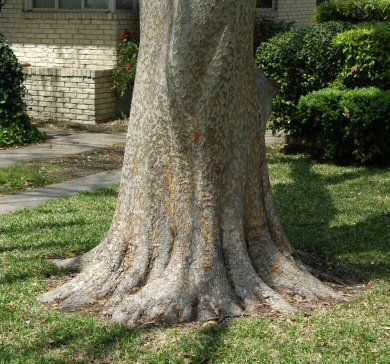 If your tree's airspaded hole holds water after a rain or irrigation, don't worry. The water will drain out or evaporate and the bark will be wet a much shorter time than before when the moist soil was on the flare all the time. Excellent root flare on a lacebark elm. 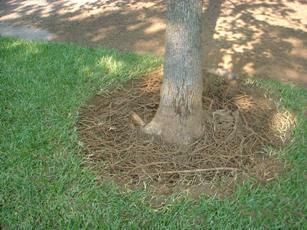 Air Spade: Soil, or even heavy mulch on trunks, keeps the bark constantly moist which can rot or girdle trees. 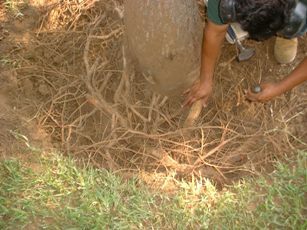 Ideally, excess soil and circling and girdling roots should be removed before planting. 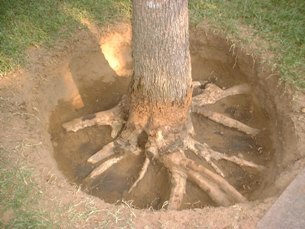 Removing soil from the root flares of existing trees should be done professionally with a tool called the Air Spade. Homeowners can do the work by hand with a stiff broom or brush. Gentle water and a shop-vac can be used if done very carefully. Vines and ground covers should also be kept off tree trunks. They should actually be pruned back away from the flares, at least on an annual basis.